India has one of the world’s richest and most prolific film industries in the world. To mark the 70th anniversary of Indian independence, Apsara Arts are delighted to present their ‘Filam India’ programme to celebrate some rarely seen true classics of Indian cinema. Tickets £7 (Concessions £6) + 50p online booking fees. Bookings can be made at Apsaraarts.ticketsource.co.uk (Ticket sales close a day before the screening). Tickets can also be purchased on the day at the Clocktower Box office in the Arts Bar, adjacent to the cinema. This opens 30 minutes before every film. Cash only. Tickets are NOT available via the David Lean Cinema boxoffice. 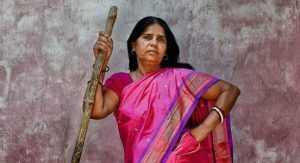 A documentary about Sampat Pal Devi and the fiery women of her Gulabi (Pink) Gang, who empower themselves and take up the fight against gender violence, caste oppression and widespread corruption. They want to change the unchangeable with an organised social action and unification. Jalsaghar organically integrates song and dance into an arthouse film. The story centres on the decline of an aristocrat and patron of classical music who refuses to be trumped by his younger neighbour. 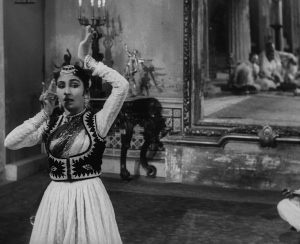 The film features music composed by Ustad Vilayat Khan and sung by the legendary Begum Akhtar, with Roshan Kumari’s kathak dance. Court is a quietly devastating, absurdist portrait of injustice, caste prejudice, and venal politics in contemporary India. Taking a pointed look at the contradictions of the Indian legal system, the story unfolds about Mumbai’s invisible underclass in which an aging folk singer emerges as an unlikely source of socio-political resistance. 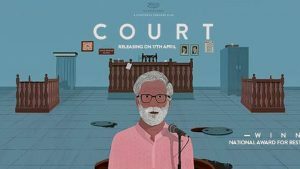 Court was met with universal critical acclaim on the film festival circuit and is one of the best films to emerge from the recent wave of independent Indian films. Hotel Salvation is a warm tale of life and relationships, embedded in Indian culture and Hindu rituals. Faced with his father’s untimely & bizarre demand to go and die in the holy city of Varanasi and attain salvation, a son is left with no choice but to embark on this journey. The simple pleasures of this timeless city are explored as father and son belatedly come to know each other in the enforced intimacy of their cramped hotel room and the teaming streets. This gentle and tender multi award-winning film will make you laugh and cry. 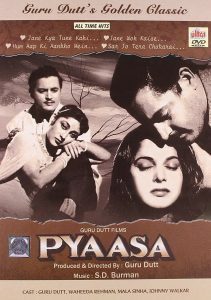 An immortal classic, Guru Dutt’s soulful, romantic masterpiece Pyaasa is frequently listed as one of the greatest films of all time. Translating as ‘The Thirsty One’, Pyaasa, set in post-independence Kolkata, the film tells the story of Vijay, a struggling poet trying to make his works known in post-independence India, and Gulabo, a prostitute with a heart of gold who eventually helps him get his poems published. Dutt’s stark black and white cinematography powerfully evokes the antagonistic forces at work in this classic romantic melodrama. 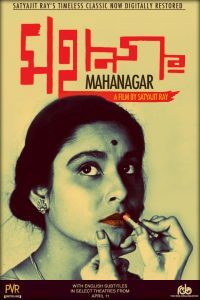 Mahanagar documents with brilliant sensitivity a changing Calcutta of the mid-1950s. The screenplay delves into the agony and ecstasy, the turbulence and excitement of shifting social mores seen through a lower middle class Bengali family when a housewife gets a job as a saleswoman. It is a profound sociological study into men and women’s relationship, a portrayal of the world of work from the point of view of women, and an analysis of the clash of modernism and traditions in a middle-class urban family. 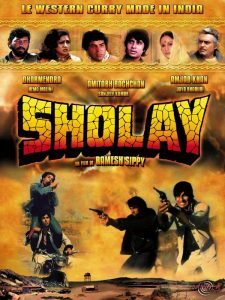 Dubbed The Godfather of Bollywood films, Sholay was ranked first in the “Top 10 Indian Films” of all time by the British Film Institute 2002 poll. The film drew heavily from the conventions of Westerns, and is a defining example of the masala film, which mixes several genres in one work. A retired police chief enlists the help of two criminals, to bring down a notorious bandit who murdered his family and terrorised the region. Opening with one of the most memorable action sequences in film history, it’s clear to see why this breathless action-adventure has left an impact on Indian cinema like no other. 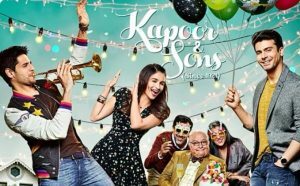 Two brothers visit their dysfunctional family and discover that their parent’s marriage is on the verge of collapse, the family is undergoing financial crunch, and much more, as the drama unfolds.